Most novels that are written are never published. Of those published, only a tiny percent, sell enough to earn royalties over the author’s advance, or get reprinted. And then even a smaller number to go on to become even moderately successful. The odds of writing a best seller is like those of winning a million dollar lottery. Writing a classic is like the odds of winning one of those hundred million dollar lotto games. Millions of books get published ever year, but few are remembered. Eventually, most all books will be forgotten. How many 19th century novels can you list from memory in ten minutes? Every book has a lifetime, and I find it fascinating to think about why a book is remembered, and then why it is forgotten. And it’s particularly interesting to think about the history of science fiction stories and novels, because they present ideas about the future that all too often become dated. I thought it would be enlightening to see if I can find a series of fan polls that asked readers to vote for their favorite SF books, and see how those popular books change over time. To save myself a lot of typing, I’m just going to use the Top Ten books from each list. For the first five lists I’m grateful to The SF Book of Lists by Maxim Jakubowski and Malcolm Edwards. I wish someone would update this wonderful 1983 book. I will use bullets when there are ties – but I will type them in the order listed. Votes, if available with be in parenthesis. Ties might bring the list to more than 10. Already we see a number of books and authors drop from the list. Science fiction was seldom published in book form before the 1950s, and in the early 1950s, most science fiction, much of what we considered classics of the era were published by small specialty publishers. It’s also interesting that by 1952 Heinlein and Bradbury have emerged as favorite writers. Some of the books from the 1952 list stayed on the 1956 list, but fell lower, like Who Goes There? and The Green Hills of Earth. It’s interesting that Slan and Adventures in Time and Space are on all three lists. So did Seven Famous Novels, but it fell out of the top ten. Slan is hanging in there. It’s hard to compare overlap because new books are coming out after each list. So where’s Heinlein? If he was the most popular writer of the times why isn’t he on the list. He had five books lower down on this list. Heinlein always competed with himself in these polls, so often his books didn’t make it to the top of the list. This 1966 list was the first that covers times I remember, and I probably read it in the magazine when it came out. These are the great books of my childhood. Already it’s possible to see how time affects the memory of books. Newer books push out older books. By 1975 Slan falls from memory after being so well remembered. 1976 also marks the first time a woman writer shows up, at all, not just for the top of the list. 1975 also represents an interesting switch. Fans did pick The Demolished Man by Bester, but from now on they pick The Stars My Destination. 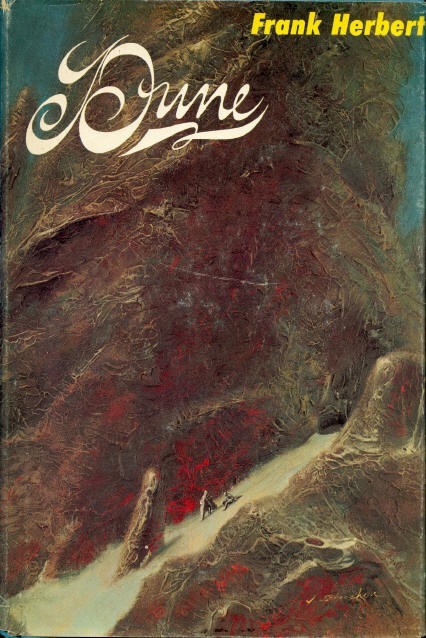 It seems Dune is becoming the Citizen Kane of the science fiction book world. Each list is now switching out a couple of new titles but is pretty much keeping the usual suspects. I filtered out the fantasy novels. For example, The Lord of the Rings came in number one. More than 5,000 books were nominated, and over 60,000 people voted. This is a huge poll. Many of the novels from the earlier lists are on it. It’s a poll from outside of the genre, yet it remains consistent. Again, I filtered out the fantasy. This was not a poll, but the books that were most read in the WWEnd database. It’s interesting to see how commonly read books are consistent with books showing up on the fan polls. Sci-Fi Lists is an online poll that is constantly updated. These two lists overlap almost perfectly, with 8 books on both lists, and they share 6 books with the 2012 poll, and 7 with the 2011 poll. Also, all of these books are fairly old, at least 30 years. It finally seems certain long term favorites are emerging. What’s sad is only one woman writer appears on all these lists, and for the same book, The Left Hand of Darkness by Ursula K. Le Guin. Read the wonderful blog Mistressworks, or Ian Sales compilation list to see what these fans are missing. Now, some of these books by women are making the polls and lists, but lower down from the top ten. If you look at cross tabulated lists like Worlds Without End and The Classics of Science Fiction, you’ll see more women on the complete lists, but it’s so disappointing not to see more. I think if SF fans would read more books like those reviewed on the Mistressworks site this would change. There are dozens, if not hundreds of all-time great science fiction book lists, but they are often compiled by one person, or a group of editors. I’ve picked popular polls that had the goal of finding the best all-time favorite SF books, and not just current ones. I’ve also ignored some British lists because they only confuse the issue at hand. Even though we’re seeing a good deal of consistent favorites in recent years, I believe if we could jump ahead 25 years, many of those books will be forgotten. Dune really is entrenched, and I think we’ll see it in 25 years. But I don’t know about Stranger in a Strange Land, that’s from the same era as Dune. I doubt Do Androids Dream of Electric Sheep? would be remembered at all if it wasn’t for Blade Runner. One good movie adaptation and a book’s memory is boosted for decades. I’ve recently reread Nineteen Eighty-Four and it is a true masterpiece. There are lots of sentimental favorites from my childhood that I wish would make a comeback, like City by Clifford Simak, and my all-time favorite science fiction novel, Have Space Suit-Will Travel by Robert A. Heinlein never makes these lists at all. I guess some books die when all their fans die. Ahhh, but if we reach an era of transhumanism, there will be no reason not to have read EVERYTHING. I wonder what the lists will look like then. I read Slan decades ago. I’ve been meaning to reread it. Science fiction fans use to think of themselves as slans. Slan you stupid auto correct! As a Heinlein fan, I concur that his “juveniles” had a much bigger impact on me than his “adult” works and I re-read them more often. But if I am limited to his adult works, I think that “The Moon is a Harsh Mistress” is a better and “more important” book than “Stranger in a Strange Land.” Think a similar position could be taken with some of the other authors represented books as well. Sometimes I think the “image” of a book takes precedence over the actual work in these types of lists. Heinlein wanted to be remembered for Starship Troopers, Stranger in a Strange Land and The Moon is a Harsh Mistress, and for the most part Heinlein has gotten his wished. There are many things about The Moon is a Harsh Mistress that I loved as a kid, but as I grew older and reread Mistress, there were many things that began to bother me. I think Heinlein wanted to be remembered for the things I didn’t like, and he’s forgotten for the things that I loved. I loved the Heinlein of inspiration of the juveniles, and the Heinlein that campaigned for the final frontier. I never cared for the Heinlein philosophy of politics. Previous Previous post: How To Build The Classics of Science Fiction 4.0 List? Next Next post: Are Our Brains Being Fucked Over by Fantastic Tales?